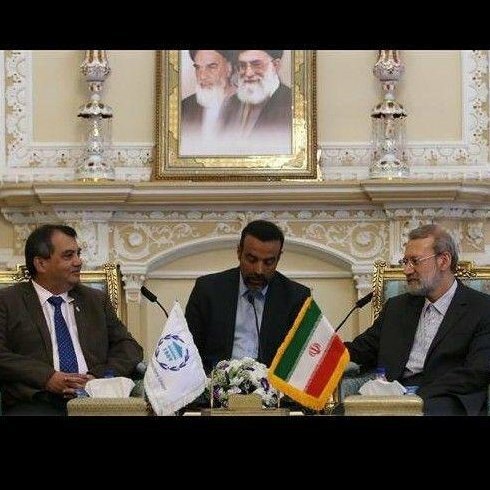 Larijani made the remarks late Sunday to Saber Hossain Chowdhury, the president of the Inter-Parliamentary Union (IPU) international institution, who was in Tehran to attend the inauguration of President Hassan Rouhani. “Iran’s strategy has always been based on the fact that issues and differences can be solved not through mobilization and militarism, but political negotiations,” he said. “And in the same way that warfare and bloodshed in Yemen and Syria have proven futile, they would not lead to anything other than human losses from now on either,” he added. As a member of the IPU, he said, Iran considers itself obliged to assist the body towards resolving international issues and crises. Chowdhury, for his part, described Iran as a “valuable and influential” member of the organization, saying he was sure Tehran could contribute much to the elimination of the disastrous situations. Terrorism is the source of wars such as the ones afflicting Yemen and Syria, he said, adding the IPU is seeking to find out how terrorist outfits are formed; the reasons for youths’ gravitation towards their destructive mindsets; and shortcomings in administration, which would leave room for radicalization within societies. The IPU is trying to have its actions complement those of the United Nations, instead of running parallel to them, Chowdhury said. It is also endeavoring to prepare the ground for dialog towards the resolution of crises in Syria, Yemen, Bahrain, and the Koreas and find a political solution to their predicaments, he added. Later during the meeting, IPU Secretary-General Martin Chungong presented Larijani with a report on the body’s talks and efforts aimed at resolving crises in war-torn countries, and asked Iran to lend more support to the drive as well as to help find political solutions to the conflicts.